You look like you are great with math, so riddle me this - 'What's a boot load of awesome plus immortal cool?' 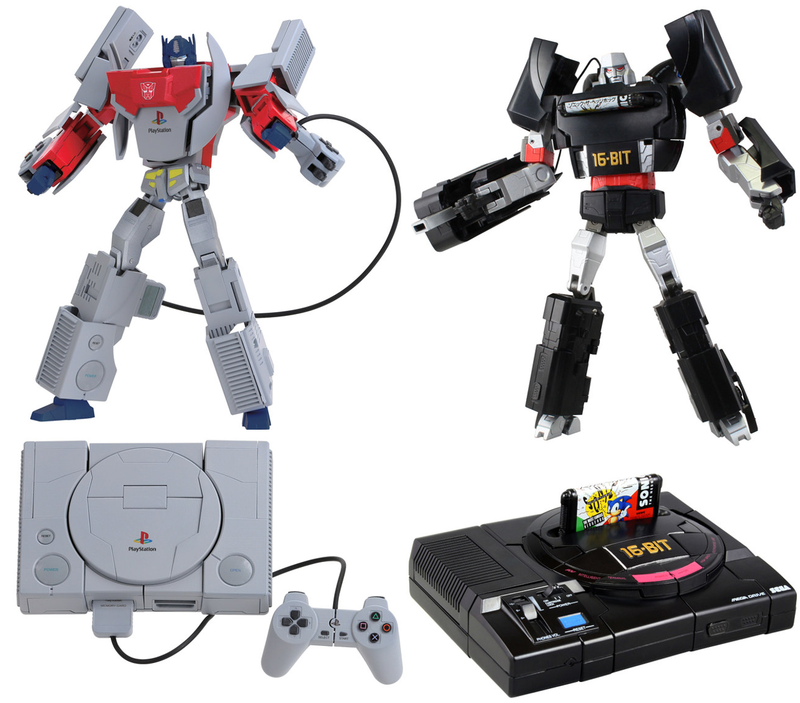 Answer: these Playstation and Mega Drive (that's 'Genesis' for you American folk) Transformers from TakaraTomy! PSOptimus Prime and Mega-tron-Drive are set to be released early in 2015 and will sting you only around $100 each! No they don't play Sonic The Hedgehog or Mortal Kombat, but there's always hope for the future. Yikes- a hundred bones? I'm good just looking at the picture. Megatron WOULD be a Genesis. When I was a kid- I had a Megatron brand TV in my room! -Man, I loved that tv... just because that's what it was called. I'm such a geek. Why this hasn't been done before, I have no idea Just screams natural progression right? You getting one, or both? Thanks guys! I think I'd be in like Flynn if it was Soundwave. He was always my favourite. Mind you if I had peeps pop out of my chest in a non-alien/soundwave way, I'd hope they'd learn to fetch me a pizza and coke before they worried about 'attack' or 'make earthquakes'.